As partner in excellence at Mercedes-Benz World, Continental Tyres is offering for the second year the chance to experience the difference in performance between summer and winter tyres, with free tests running between October 24th and November 1st at Mercedes-Benz World, Weybridge. UK drivers are six times more likely to have an accident during the winter months, with the numbers rising further when snow and ice add an extra hazard. 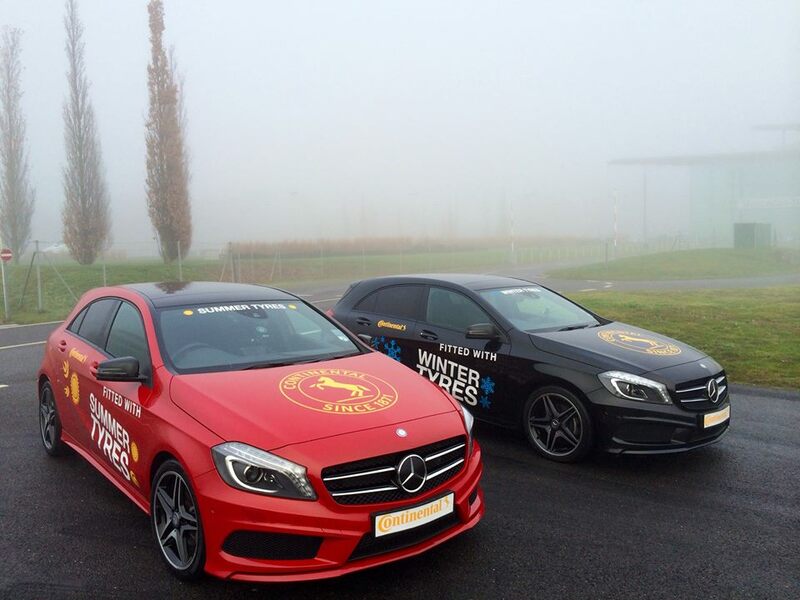 With this in mind Mercedes-Benz World and partner in excellence Continental provided a free driving experience in two cars through a slalom on a simulated icy track. One fitted with Continental summer tyres and the other with Continental winter tyres, providing first-hand experience with the notable difference in stopping distance. Last year Continental successfully offered over three hundred motorists winter tests and the responses were unanimous, demonstrating a clear difference between summer and winter tyres when temperatures drop below +7 degrees centigrade. Prior to experiencing the tests 82% of those that took part had never experienced winter tyres. Following the free demonstrations 98% said that the Continental winter tyres exceeded their expectations and proved a valuable exercise. Nine out of ten motorists went on to say that they were now very keen to switch to winter tyres for the colder part of the year. There remains a huge lack of awareness in the UK about winter tyres. Some research conducted by Continental identified that nearly half (47 per cent) of motorists are unaware that winter tyres even exist. Any time the temperature dips below +7 degrees centigrade you’re better off on winter tyres. This is because unlike summer tyres (everyday tyres), winter tyres do not harden at lower temperatures. That means they give you a much better grip on the road and the ability to stop in a shorter distance, increasing your safety whilst driving. A vehicle fitted with winter tyres will come to standstill on a snow-covered road (from a speed of just 30mph) after 35 metres – with normal tyres the braking distance required is a further 8 metres (43 metres). That is another two car lengths. Data from the Department of Transport found that the percentage of UK car accidents caused by skidding is 48 per cent in the winter, compared to just 11 per cent in dry conditions. Mercedes-Benz World, The pioneering brand experience centre opened in 2006, offering an interactive world full of Mercedes-Benz passion, heritage, values and innovation. Tyres from Continental ensure optimum performance to give dynamism and precision handling with the highest safety reserves throughout every driving experience. Continental is well placed to serve the many and varied demands of the entire Mercedes-Benz, whilst also demonstrating the difference between summer and winter tyres. Check tyres for wear often and replace if necessary. The legal limit for tread depth on tyres is 1.6 mm, but safety experts at Continental Tyres recommend a minimum of 3 mm for wet weather safety. Ensuring tyres are correctly inflated will also improve your cars handling as well as saving you money. Continental produces winter tyres in 200 sizes and is the leading supplier of winter tyres in Europe.